Have you ever noticed that you can get things done to other people’s deadlines (maybe you always get a client project finished right on time) but aren’t very good at sticking to deadlines you’ve set yourself? If so, welcome to the club! 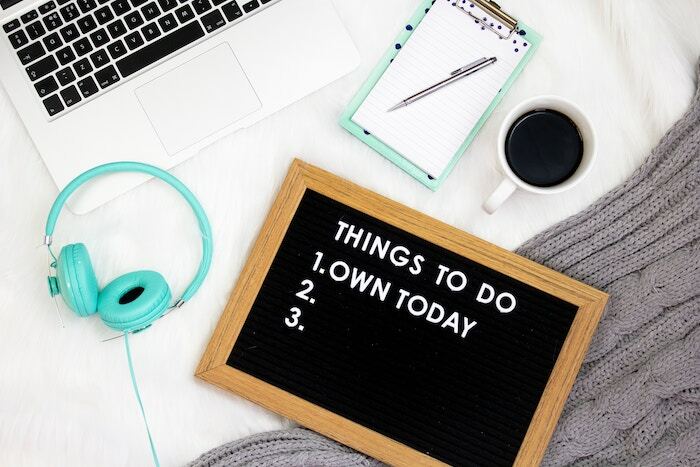 That is me to a tee – Gretchen Rubin calls me an Obliger – and that means I have had to learn to set up all manner of accountability tricks to keep me on track! Even if you’re not quite as bad as me, you might still learn something from all my accountability tips here – and if you’re much better at it, perhaps you can give me one of your tips in the comments. I always need more! So, some of you will have heard this story. Some years back I formed a small peer mastermind with two friends; we all worked in different areas but were like-minded in many ways, and we all wanted to grow our businesses. There are lots of Facebook groups that encourage you to share you daily or weekly tasks and just by posting them in a group like that, you can get some extra accountability (my friend Sam’s #reallifebiz group is a good one for this). I’ve found it’s enormously helpful for me to publicise some of my tasks and goals – for example, with my 19 for 2019 tasks. One of the items is to launch a new podcast for kids, which feels like a big job and something that I sometimes think is too much, but because it’s out there, people I know often ask me about it, and that keeps me on track (because I’m sure it’s an awesome idea!). The best example I know of this is that I virtually never eat junk food in front of my son! (Admittedly, I should eat less junk food when he’s gone but still, the point is, being a role model is a great accountability hack!). This also works for me in business, for example, with my mastermind groups I sometimes set challenges for the wider group such as updating our LinkedIn profiles or revising our About pages – and because I’ve set it up that way I know I will find myself having to do this too, as a role model, which is a good thing! I am a list-maker extraordinaire, and I always have been. There are so many different versions of the “ultimate list making technique” out there and I have tried a lot of them, but my biggest tip is to accept that sometimes a system will work great for six months and then you might get bored and need to change it (and that’s OK!). For list lovers, there are all sorts of apps, and then more powerful project management-style tools like Trello. They take list making to a whole new level but also let you gather lots of information in one place (which can help make tasks easier, too). I personally like Trello (even though I probably only use 10% of its features) – one of my favourite things is that you can make checklists that you can easily add to new tasks. For example, I have a checklist for all the things I need to do when I publish a new podcast episode (eg share it on various social media, email the guests who appeared on it, etc) and that means I never forget to do all those important bits. To people who this wouldn’t work for, this sounds silly, but for people like me, this is very effective!! It’s not dissimilar to your Fitbit rewarding you with fireworks when you reach 10,000 steps for the day. For a couple of years I used an app on my phone called Forest to keep me on task at my desk. I’d set a timer on it for forty minutes and a little tree would start to grow on the app; if I stopped work (and in particular if I touched my phone) the tree would die! Honestly, my desire to keep growing my forest – and to “level up” every so many hours to be able to access different kinds of trees – kept me glued to my keyboard. It had a beautiful side benefit in that after a certain number of hours of work a real tree would be donated somewhere on your behalf. Eventually I ran out of game objectives and then it stopped working for me – but in the meantime I had developed a good habit of sitting down and working hard for bursts of time. Similarly to gamification, this works for the right people (like me!). Sometimes a visual accountability system works wonders if you’re trying to achieve something over a longer period of time. For example, trying to reach an income goal, and you can colour in a part of an image for each $100 you invoice or receive. A friend in my peer mastermind recently set herself the challenge of writing 100 blog posts in a couple of months and is using a visual page of 100 circles to colour in, one for each post, to help hold herself accountable for achieving that goal. This one has never quite worked for me but it works brilliantly for others, so it’s on my list. Basically it means finding someone who you can talk to frequently (daily or weekly) about what you need to do and they’ll hold you accountable to doing it. Sometimes just knowing that you have to tell somebody else that you’ve failed to finish something is enough to keep you going and get it done. In a sense, having a coach is like paying someone to be your accountability partner (they’re more than that, too, but this is a key part!). I have an awesome coach, Audrey, who both helps me out with the directions I can take and is a great sounding board, but importantly, holds me accountable to tasks between our calls. She is so lovely that I do feel obliged to make sure I’ve finished up those tasks or I’d feel I’d let her down (and know I’d let myself down too). Sometimes paying for someone to do this makes you way more likely to act on it – works for me (and she’s paid for herself many times over with the work she’s helped me to get done). This can work in lots of ways. For me, I have a podcast producer and as well as meaning I didn’t have to learn all the tech side of podcasting, it helps me enormously from an accountability point of view. They need me to get my podcast files to them at a minimum a week ahead of the episode release date, and that deadline helps me a lot in getting it to them (nearly always) on time. 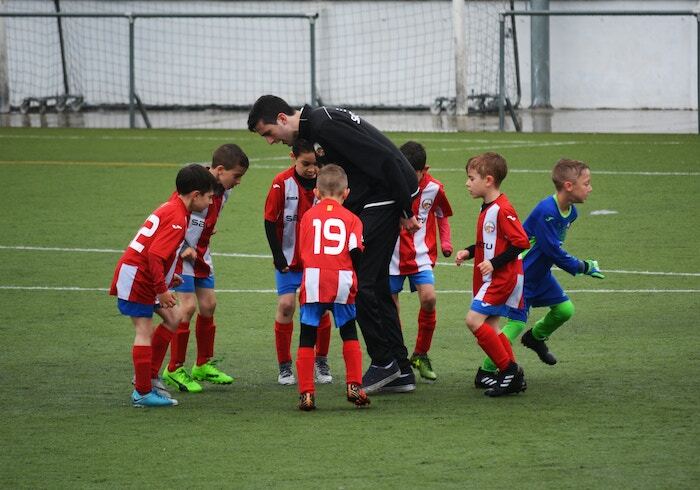 I also work with assistants from time to time and find that when I promise work to them I make sure I get it ready, because I’ve told them it’s coming – and that’s another form of accountability! Of course, mastermind groups are on my list, not least because I run quite a few of them now and have seen, over the past three-plus years, how effective these can be as a form of accountability. I’ve also been a member of several masterminds and am currently in a peer mastermind with eleven fabulous women spread across the world – we meet fortnightly on Zoom and are in regular contact in a Facebook group, and we are all there to help keep each other in check, and it works brilliantly. What’s your biggest accountability tip? 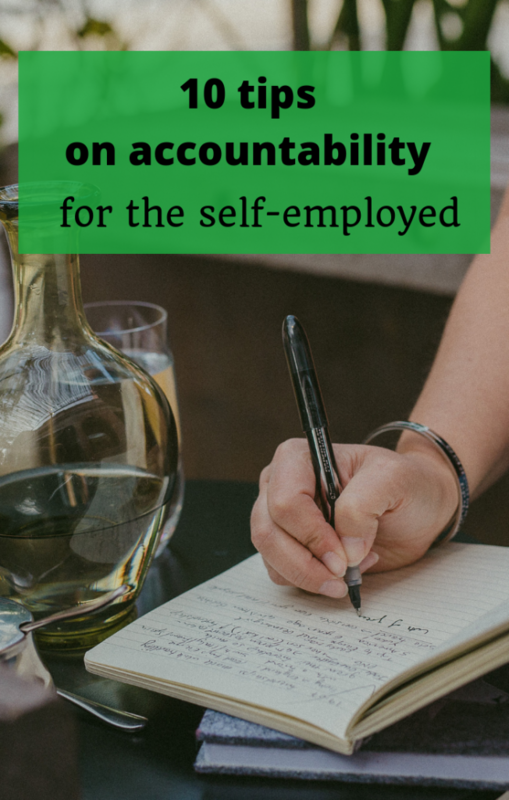 So, these are just the accountability tips that I personally use – you can see I have had to be inventive over the years to get myself to get things done – sometimes I think I am the least-suited person to being a solo business owner! But above all, I’ve learnt to go with my various strengths and weaknesses, and since getting things done – especially the things which nobody else is sitting and waiting for, since I have no boss – can be a weakness for me, I’ve learnt to use all these different accountability tips to get my tasks done. But I’m sure there are still more tips out there – could you leave a comment and let me know yours? I found an accountability partner back in 2015 and it works so well for me. We’ve become more ‘go with the flow’ and are in touch every day, but back then we used to email weekly goals and wins and thoughts. We were working in very similar areas back then but our businesses have changed focus and direction several times since then, but we still remain online business besties. The funniest thing was, we found each other online. And then we discovered we lived about a kilometre away from each other. Village internet, eh? Oh that’s hilarious that you were actually physically nearby!! I’ve tried it in the past but I think it’s a challenge to get exactly the right person – sounds like you have done well there though! Amanda, the idea of colouring in countdowns really appeals to me. Thanks for that one. The new colour is eyecatching! Thanks Maureen! And yes the colouring in countdown can be lots of fun to have a visual representation of a goal – I have used it many times! As soon as I read the words colour in and countdown I started paying closer attention to your post and even re-read it. I have a habit tracker calendar so maybe I should begin to colour it in rather than ticks . A timely blog post Amanda.